For the Deathmon in C'mon Digimon, see Deathmon (C'mon Digimon Version). Like Demon it was originally a high-ranking Angel Digimon, but it fell to the Dark Area and is now one of the Demon Lord Digimon. Even though it is a Demon Lord Digimon, it is different from other Fallen Angel and Devil Digimon in that it does not carry out evil to its limit, but instead watchfully maintains its thoroughly neutral standpoint. However, it is a terrifying Digimon, and it is told that at the time of the approaching final battle, that whitened appearance will change to jet-black darkness, and it will transform into a god of destruction. Its Special Moves are an arrow of death fired from the evil eyes on its hands (Death Arrow), and a laser beam fired when the eye in its head shines deep crimson (Explosion Eye). Title: 「３つ目の破壊神」 — "The Three-eyed God of Destruction"
Anime/Manga Digimon Adventure V-Tamer 01: "Desparate X Situation! The Ultimate's Arrival!!" Neo Saiba fought Yagami Taichi and Zeromaru with a Deathmon that he formed from a Megadramon (who was formed from a Cockatrimon and a Kuwagamon) and a Jyureimon in a fight for the V-Tag of Sky (in the manga this evolution is called Triple-Jogress, since one partner is already a Digimon created by a Fusion Evolution). While Zero was able to hold himself well against the Megadramon, the powerful Deathmon was too much for Zero and he was nearly defeated. When Taichi fell of the cliff, Zero jumped to rescue him and in this process Zero evolved to Aero V-dramon. In his new form he not only was stronger but could also fly and thus was able to destroy Deathmon by cutting him into pieces with his V-Wing Arrow attack. 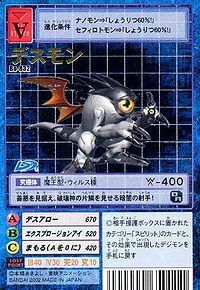 In a Manga side story, Metamormon became a Deathmon to fight Kanbara Takuya who became Agnimon. Can be evolved from Mummymon if above level 49 and Qualities above 56, or can be found at Core Field. Can be evolved from Ex-Tyranomon if level 49, Mind 230, Defense 230. Deathmon is a obtainable evolution of Agumon. 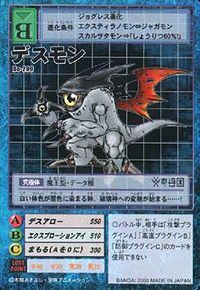 Deathmon can only be obtained as a collectible card. Deathmon is available as a Digimon Medal. Appears in Area 02 as the boss. 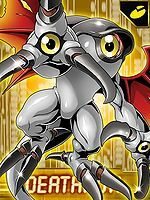 Deathmon is available by DigiXrossing Devimon, Barbamon and Phascomon. 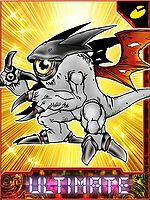 Deathmon is an unobtainable Leader Digimon. When its white body turns dark, that's when it begins its transformation into the god of destruction...! This archer of darkness gazes upon good and evil, showing a glimpse of the god of destruction! ↑ 7.0 7.1 Digimon Adventure V-Tamer 01: "Desperate X Death! Ultimate Appears!!" 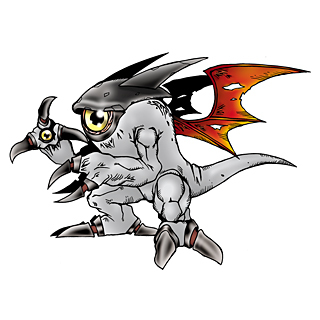 ↑ Deathmon was adopted from a winning Digimon entry in the Second Original Digimon Contest (Digimon Web).